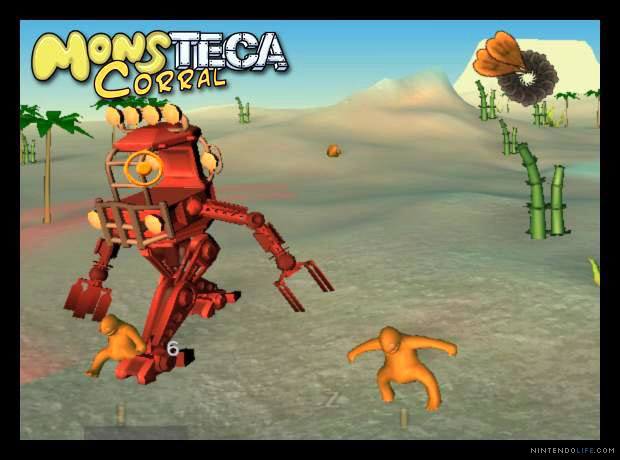 So far we haven't been told much about Onteca's upcoming WiiWare title Monsteca Corral, so when the developers offered us to see the game in action for ourselves we jumped at the chance. It's tough to describe Monsteca Corral in traditional genre terms, but it's perhaps closest to a real-time strategy game, although it also reminded us of European GameCube launch title Doshin the Giant. You begin each level controlling a Sdompy, a little orange chap who waddles around the world looking for other Sdompies to join forces with. So far, so standard. Increasing the size of your corral is only one element, though; you complete each level by collecting bubbles located across the map and returning them to your transportation. It's not a rocket or a car, however – it's an AstroMaggot. Give the greedy grub enough food and it burrows out of the ground and takes off, leaving you to flick your Sdompies in the air, attaching them to the bug with silk and finishing the stage. We promise, this is all true. You control your tiny tangerine troopers with the Remote's infra-red pointer, pushing to set your destination or holding it to make your corral follow the pointer. Flicking your Remote lets you jump in that direction, useful for avoiding attacks, although it's about as accurate as you'd expect. Using the pointer to "paint" the Sdompies you want to control is a more natural way of selecting than most other strategy games on the console, but once they're in your command you don't really do much. Sdompies seem to have very few talents: they can walk, jump, carry bubbles and attack houses, but that's pretty much it. The main problem with this early version of Monsteca Corral is the lacklustre presentation. The graphics are poor, with some extreme fogging, bland textures and little to no animation; Sdompies waddle about like John Wayne with a coat-hanger in his trousers, and the AstroMaggot floats perfectly straight with not even a waggling leg in sight. The music is similarly mediocre, with MIDI instruments and repetitive composition. It's worth pointing out that this is an early version of the game and Onteca don't expect to be finished with it for a while, but as it stands Monsteca Corral could easily be a PSOne title. 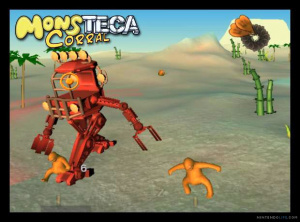 There's a fair while to go before Monsteca Corral is launched on WiiWare, and hopefully developers Onteca will take the time to brush up the graphics and sound to bring it in line with the majority of WiiWare games. There's hope yet, AstroMaggot fans. so early. Seems like an interesting idea, though. Pikmin, sort of? I does look strange to be sure which I can appreciate. Hopefully they'll take your observations to heart James! I'm curious how this is going to turn out. Once they get a little farther into development, I'd like to see it. It sounds like they're not even close to being done yet. i work in art gallery in liverpool & we had exhibition called space invaders! real space & virtual one, we have this game in exhibition & its not amazing been playing it and every level is same boring run around collect bubbles feed the astromaggot & repeat! controls are ok but waggling wii-mote jump is inprecise and dull! i cant see many people going mad over it! or for that matter reviewers even giving it score over 5! The words "Spore" and "Civilization Stage" come to mind. A little too much.